A bio-epic on the order of Lawrence of Arabia, Patton is a smart, fully realized historical film. 172 min. 20th Century Fox. Director: Franklin J. Schaffner. Cast: George C. Scott, Karl Malden, Michael Bates, Stephen Young, Michael Strong. To hear Oliver Stone tell it, a direct line runs from 1970 Best Picture winner Patton to an emboldened America's bombing of Cambodia and the resurgence of the Khmer Rouge—a film leading "directly to genocide." And according to historian Robert Brent Toplin, the movie's number-one fan Richard Nixon was so pumped up by Patton's gung-ho spirit that he initiated the domestic surveillance that spawned Watergate. But no film should have to carry the burdens of the cracked Nixon administration. Just because Franklin Schaffner's Patton is such a potent piece of cinema doesn't make it responsible for extremist takes on it. In fact, part of Patton's brilliance is its even-handed refusal either indiscriminately to praise or condemn a "great" (read "successful") American who was also a dangerous egomaniac only satisfied when embroiled in war. Released during the Vietnam War, Patton was received as a Rorschach test that allowed both "doves" and "hawks" to believe the film was speaking to them. And it was, but better yet, it opened a national discussion on the meaning of the man and his symbolic relation to his country. 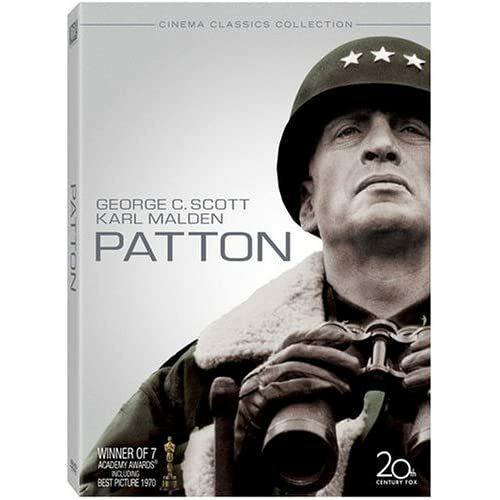 The film flouted convention by opening with a six-minute monologue delivered to camera by Gen. George S. Patton (reluctant Best Actor winner George C. Scott) before a giant American flag. "All real Americans love the sting of battle," he barks to his army. "When you were kids, you all admired the champion marble shooter, the fastest runner, big-league ball players, the toughest boxers. Americans love a winner and will not tolerate a loser. Americans play to win all the time. I wouldn't give a hoot in hell for a man who lost and laughed. That's why Americans have never lost, and will never lose a war... because the very thought of losing is hateful to Americans." 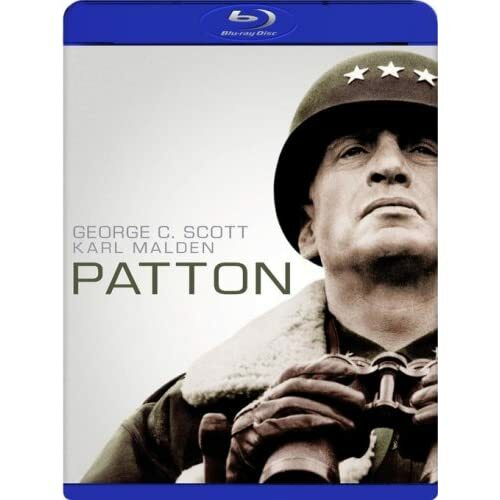 Rolling back to 1943, then advancing through a tumultuous two-year run for Patton, the film demonstrates how WWII was the culmination of Patton's hopes for himself, the ultimate opportunity to prove himself America's alpha winner. As such, the film embraces the notion that Patton saw the British General Bernard Montgomery (Michael Bates) as a rival nearly as contentious as the Germans' Field Marshal Erwin Rommel (Karl Michael Vogler). In Tunisia, we see how Patton would whip a unit into shape, get the lay of the land (entranced by the places where Greeks, Romans, Carthaginians once fought and died), and make plans of action. "Compared to war," he says with reverence, "all other forms of human endeavor shrink in significance." Working from books like Ladislas Farago's Patton: Ordeal and Triumph and Omar Bradley's A Soldier's Story, screenwriter Francis Ford Coppola played up Patton's unexpected qualities: his writing of poetry, his belief in reincarnation, his self-styling as a tall-standing man in uniform (Coppola was later rewritten by Edmund H. North under director Shaffner's supervision). German Captain Oskar Steiger (Siegfried Rauch) sizes Patton up as "a romantic warrior lost in contemporary times," and the film positions him quite clearly as a latter-day Don Quixote: a hero, perhaps, but perhaps too crazy and pitiable to lead a sizeable modern army. Serving under Patton, General Bradley (quietly convincing Karl Malden) tries and fails to temper his ego-driven superior with reason; later, having surpassed Patton, Bradley models sane leadership. "There's one big difference between you and me, George," says Bradley. "I do this job because I've been trained to do it. You do it because you love it." The film has been criticized, understandably, for omitting Patton's most ignominious defeat: a self-sanctioned, disastrous out-of-bounds raid on a P.O.W. camp that held his son-in-law, but it's hard to imagine such a sequence fitting into a tightly structured, already three-hour film. Soldier 1: There he goes. "Old Blood and Guts." Soldier 2: Yeah, our blood and his guts. A bio-epic on the order of Lawrence of Arabia, Patton is a smart, fully realized historical film, with a flat-out brilliant score by Jerry Goldsmith, top-flight cinematography by Fred Koenekamp, and direction by Schaffner that would do any general proud. 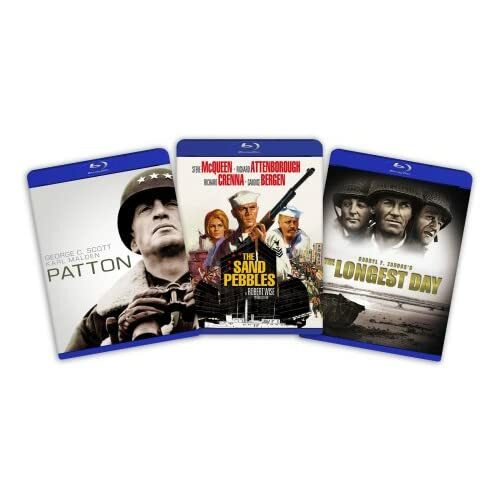 The word for Patton on Blu-Ray is stunning. A flawless transfer and DTS HD 5.1 Master Lossless Audio sound make this 38-year-old picture look and sound better than I ever thought possible. Plus, it comes to Blu-Ray with a full complement of bonus features (in good-looking standard definition) ported over from the previous DVD editions. Disc one kicks off with a trailer for Jumper, then accompanies the film with a forced "Introduction by Francis Ford Coppola" (4:54). An optional full-length, screen-specific commentary track by Coppola gives the co-screenwriter's detailed perspective on the film and its subject (and the work of rewriter Edmund H. North), but also has a tendency to lapse into a narration of what we're seeing. Disc Two houses three thorough documentaries. "History Through the Lens—Patton: A Rebel Revisited" (1:30:10) is a 2001 installment of the fine History Channel series, narrated by Burt Reynolds, that examines a film's making while noting the discrepancies between the film and the history it depicts. This double-wide installment gathers a crack team of commentators: studio executive David Brown, Richard Zanuck, DP Fred Koenekamp, George's grandson Robert Patton, Gen. Bradley's aide Chet Hansen, Col. Cole Kingseed of West Point, and WWII vet/author Paul Fussell. "Patton's Ghost Corps: The Soldiers He Left Behind" (46:38) presents May 2004 interviews with 63 veterans from the 94th Infantry Division of Patton's 3rd Army. There's a distinct anger to this piece that serves as a good counterpoint to the generally positive take of the History Channel doc. The 1997 making-of doc "Patton: A Tribute to Franklin J. Schaffner" (49:49) features audio interviews by Shaffner and George C. Scott, as well as talking heads Zanuck, Koenekamp, Jerry Goldsmith, producer Frank McCarthy, and Oliver Stone; it also presents behind-the-scenes footage and camera tests. In the disc's home stretch come too terrific montages: a Production Still Gallery Accompanied by Jerry Goldsmith's Complete Musical Score (36:24) and a Behind-the-Scenes Still Gallery Accompanied by an Audio Essay on the Historical Patton (53:19); the essay is the loquacious work of Charles M. Province of the George S, Patton Historical Society. Last up is the film's Original Theatrical Trailer (1:46). This is the definitive home-video special edition of 1970's Best Picture—you can't afford not to get this one. All site content © 2000-2019 Peter Canavese. Page generated at 04/25/2019 07:53:07PM.